Eiji Aonuma Wants the Wii U Zelda's Hyrule to be "A Setting No One Has Ever Imagined Before"
The Legend of Zelda can be a contradictory series, at times. It's tempting for gamers to reel off a list of what binds the various entries together, perhaps even bemoaning similarity in dungeon and collect-a-thon structures. And yet it's a series that's experimented with stylus-only controls, truly strived for true motion-based combat, and taken its settings above the clouds and out to sea. Beyond some core mechanics, there's perhaps been more creativity in the franchise than is often assumed. A key figure in the franchise as it's evolved, and the individual most commonly known, is Eiji Aonuma; he's had senior roles in the series since The Legend of Zelda: Ocarina of Time, before stepping up as Producer for The Legend of Zelda: The Wind Waker. The most recent release, of course, is The Wind Waker HD on the Wii U, a title that is set to influence some of the GamePad mechanics in the next Zelda title on Wii U. The re-release / remake has received plenty of critical acclaim since its arrival, which is perhaps contrary to some degree of controversy when the cel-shaded art-style was originally revealed for the GameCube. Perhaps time heals the wounds of surprised Zelda fans, but in an interview with GamesTM magazine Aonuma-san acknowledged the importance of visuals, and their style, to the audience; yet he reiterated that striving for a unique look is one of his objectives. When something unexpected happens, the first reaction people have is to be wary. ...I try to make games I work on unique. Not only in terms of gameplay, but also in terms of graphical style. I want the game to be unlike anything I've seen anywhere else. Changes to the graphics also help to change preconceived ideas and have a big impact on the gameplay. Because the graphical style can lead to uniqueness like that, I think it really can't be ignored. 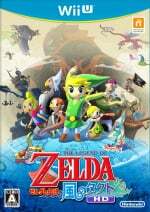 An emphasis on unique ideas can perhaps be called into question with the knowledge that upcoming 3DS release The Legend of Zelda: A Link Between Worlds is widely acknowledged as a sequel to The Legend of Zelda: A Link to the Past; despite this, Aonuma-san maintains that it didn't begin as a sequel, and still sits beside The Wind Waker HD as an indication of new gameplay and control ideas that may transition into the next Wii U release. As A Link To The Past was what made me want to make games in the first place, it is a truly moving experience to be working on the sequel. ...I am worried about whether the fans are going to like it when it is released. We did not start making this game on the notion that we were making the sequel, and it happened as a matter of course as we developed unique ideas into a game. ...Wind Waker HD and A Link Between Worlds also give a little glimpse of this. These games may feel a little different from the experiences you've have before and this will be a lot stronger in the new Zelda. Aonuma-san was unsurprisingly tight-lipped on any details of the new Wii U title in the works, but did go so far as to make clear that his recent Nintendo Direct promise of shaking up the conventions of the franchise were not hollow. In this case he emphasized that the setting is up for experimentation. There are no limitations on what kind of place Hyrule can be, other than that it is a country where Zelda exists as its Princess. We now have many titles in the series, so we are seeing characters and location names from previous titles coming up again. We are using these when it adds to the fun, but there is no rule that we have to use these at all. We may even need to change things you might take for granted like Zelda being a Princess. I would really like the next Hyrule to be a setting no one has ever imagined before. Let us know what you think of Aonuma-san's comments, and the setting you'd like see in the new Wii U Zelda, below. Underground steampunk Hyrule. You heard it here first. Still waiting for a future dystopian Zelda. I'm sure it's much too late to change it now, and Nintendo are against deep stories and lore but it would have been great if after saving Hyrule, Link had gone into adventure in a new kingdom, like how Elder Scrolls games move to new countries within the same world to keep things fresh. It always seemed weird to me how each game is a new link, saving a new princess from a new version of Ganandorf in a different point in Hyrule's history. It just gives the impression each new Zelda is a remake rather than a sequel. I just hope its a huge area & fun to explore. With lots of well hidden secrets & such. I want part of the fun of playing the game to simply go wandering. & I want weather, lots of real weather changes & not just limited to a snowy mountain area or whatever like past games, but have the entirity of hyrule's weather keep changing dynamically or something like that. I'd prefer it in the style of the Zelda Wii U tech demo. Sorry, I should have mentioned that it comes complete with upside-down ice cream volcanoes. I could dig a steampunk Zelda title. Make it vast, make it engrossing. Make it so. @Wonder_Mask Yeah maybe an island like in Link's Awakening, with a lot of sidequests and non story dungeons to explore! They could even do some dream sections where everything could happen, like... in a dream! (kind of a dark realm in A Link to the Past or shadow realm in Twilight Princess). Oh! And Nintendo should let Platinum Games make a post-apocaliptic futuristic steampunk action game. Zelda should be playable and all weapons have a futuristic look. There still should be a lot of exploration and the usual sound when opening treasure chests. AND he might meet Samus in a space level and team up with her! And a semi-mechanical Epona that has rockets and can fly! You need to be in the brainstorming session. Nintnedo, I so want this game !! Yesterday I played both Windwaker HD and Skyward Sword, and I realised that I had no fun playing Skyward Sword ... The Gamecube game so much better and fun to explore. Ha! Anyway, I'm sure I will love the new Zelda made by Anouma and hope the maintain the high quality. But I was serious when I said some other producer could make a more sci-fi zelda (like Retro or platinum). Oh lately aonuma is quite talk active so are we getting real info soon???? And how about a yedi link? Whatever the place may be (just nothing futuristic), I hope it won't be empty and lack activity like Hyrule field in Twilight Princess, since this is going to be a huge Zelda game. I want it to be full of emotion though. I want to have a sense of smallness and hopelessness at times. Like someone mentioned here before, random weather changes would greatly add to the whole ambience, atmosphere and mood. A great example of an emotional game is that Journey game which I've only read about and seen gameplay of. I would love a setting in Zelda to have an emotional impact similar to that, not only in the visual sense, but also the sounds and music need to be deep and moving, as well as the characters..something we've seen in Majora's Mask, where each character had their own tale. Basically, I wish for the setting of the next, new Zelda game to be dynamic, be full of life, evoke emotion, really get me going and immerse me into the game. Due to modern technology, this is all possible. Aonuma is absolutely right. I see people argue about graphics, but it's the visuals that make out everything..the artstyle. Skyward Sword is great in that department, as it provides us with new and unique, purely artistic visuals, which greatly add to the experience. As I mentioned the graphical ability, we need to have more realistic weather changes, not only predetermined ones. One thing I loved in Ocarina is how when you let Link stand around in a cold/snowy area, he sneezed, or in the desert he'd wipe sweat off his forehead. We need more of that, more connections with the player, more personality, and more hints of vulnerability and anxiety. Coming out of the water, Link's uniform/tunic and equipment need to appear wet and heavy (for at least a short period of time lol), as well as after some rain. Combat should be slightly affected by such conditions too (heavy rain, blizzards...). And lastly, before I get way too into it, I'm going to add that we should get more choice of attire. For example, when going into a snowy mountain, there should be a shop or something, a way to get a kind of jacket, maybe with fur and what not (not promoting real animal fur ..actually, perhaps Wolfos fur lol). Basically, I want for Link to be able to wear the appropriate uniform/clothes for different and according areas. Ocarina's different tunics are great, but visually, they are merely palette swaps, although with different traits. Considering that being 1998, for 2015 or whatever, we should get more choice of clothing, even some minor optional things, like long sleeve vs. short sleeve under the main, green tunic..choose a type of chainmail...etc. I know these are probably unnecessary little nitpicks or whatever, but I find that these elements add to the overall connection between the character and the player. A little bit of personalization could only do good in a grand game such as Zelda. GTA implemented that ages ago, and it added to the experience. Even in Mario Sunshine, Mario had short sleeves respectively, and if I recall correctly, you can unlock sunglasses and a Hawaiian shirt. I find that really neat. All in all, I don't care where it takes place, as long as there is variety. WW has the ocean (sailing) as its main setting and overworld/predungeon hub. SS has the sky (flying). The next one should return to solid ground, as I'm sure it will, but also include areas where you can sail. I know SS has that, but it was very minor. I want to be able to ride Epona to the shore, only to have myself enter a small boat, with which I can reach different islands and possibly various dungeons. We also need more abstract dungeons. Keep the usual elemental, fire, water...etc. dungeons, but add more unique, creative and unexpected ones like we saw with the mining facility in SS, as well as the Sandship. I just want to add; Mr. Aonuma and team, take your time, we have the patience, and I'm sure we'll love the end product. I don't like the artstyle in the new Legend of Zelda: A Link Between Worlds. It has that horrible platicky rendered look that I don't like with slightly dirty, blurry and dated looking textures that will just age badly. So, it's not off to a great start in my books. Sad considering how amazing a game like Wind Waker looks. It'd be nice if they applied this same, different visuals philosophy to Mario, as well. @Goginho Everyone disses Twilight Princess' Hyrule field as being empty and useless, except the one in Ocarina was even more so. At least Twilight Princess' felt like a legitimate connection between areas and not just a hub with convenient doorways. 'Course, I understand that the hub-like nature of it was due to technical limitations, but I still feel it's unfair to have such a double-standard. @Kirk Yeah, I have to agree with you and Otero on that one; the art style in A Link Between Worlds looks so rubbery and kinda dull. I just had the craziest thought! Zelda is to be based in a city that can be visited via "X" as in the trailer footage. Give it a bit more steam punk, a few mechs and other destinations and they could have a grown up, story driven Grand Theft! Gangs have nothing on ogres and skeletons! Ha. What's with all this "steampunk" talk? @OorWullie I love your idea about going 100 years into the future to change things in the past. Maybe to get a new arsenal of weapons that can defeat Ganon. I also think hyrule should be of the major lands, there should be others you can only get to by water, flight and through time travel. Each should have there own characters and their own main villain and somehow tie all of that together. Make it epic but also allow you to choose where you want to go for the moat part. Make it a gigantic desert and Link has to explore ruins and pyramids and get 3 mystic things to revive the mummy of Zelda to fight the dark lord that cursed the land. I like new, fresh, unexpected. Bring it on. But please make the world matter in terms of size and density and amount of stuff to do and see and live through. The skies were a bit empty in skyward sword, the field was big and irrelevant in twilight princess - the best nintendo have done is the sea in wind waker, though the islands were a bit too much of the teenie tiny kind and less of the bigger kind. @Genesaur No you're definitely right. Ocarina was somewhat like Mario 64. The centre of it all is basically a big, round circle of nothing but a couple of trees, and i agree that it was more empty than Twlight Princess, but I usually compare it to the fact that they are eight years apart, and a few Zelda titles apart, so I think Ocarina is excused and they should have done more with TP. I like the grand scale of Twilight, and how it all connects together, instead of, like you mentioned, the 'doorway system' of Ocarina, but there is a lack of variety in TP I find. There was so much potential to do more. Maybe they played it safe, and it certainly is okay the way it is, as I find it is going in the right direction of openness. I just want that Nintendo imagination to kick in for the next title, have plenty of secrets, hidden areas, shops, various foes and monsters, even allies, as well as optional sidequests..and maybe the occasional, optional (and quite difficult & tricky) dungeon, such as how Ocarina had Gerudo's Training Ground, where you can not only test and hone your skills, but also acquire useful items. I have to agree with that shiny, plasticky, rubbery, generic look. I'm not really a fan of that. I like visuals with more natural and organic aesthetics. We'll see how Between Worlds looks in our hands, some things from the trailer actually look quite impressive. I like the way some cutscenes look though, specifically the one with Zelda. @erv That's how I feel about the last few locations. I hope the next Zelda is completely open like WW but has a land mass at least the size of TP's, an explorable sky and sailing. If they want to give it a dark world, I'd locate it on the other side of the globe. I think all the recent Zelda games have had something good that the others don't but they still haven't made 'a new Ocarina' i.e. a game that is not only the best adventure game ever made but also has loads of stuff that just steals your time like fishing and horse archery in OoT. "I would really like the next Hyrule to be a setting no one has ever imagined before." @Kirk I couldn't disagree more. So basically the steam punk crowd wants "Zelda Fantasy". I'm content to let Square-Enix come up with those games. Huge world with the ability to ride a horse , boat or bird ??? I just hope there is a decent overworld,the sky from SS was pretty disappointing to me. @Ricube I think Zelda is post apocalyptic. You see references to past long dead civilizations of people with great technology, in skyward sword your sword has an A.I. and it's supposed to be the beginning. I often see Zelda games in the same light as vampire Hunter D where there are small pockets of people clinging to a simpler life forgotten by time, but reborn through necessity. Well you're entitled to be wrong. I think they should just blow the doors open on the whole timeline and make this story about all the Hyrules, all the Links, all the Zeldas. A culmination of everything in Hyrule Historia ending with a true final battle against Ganondorf. Not just one Ganon either, but all of them....and their minions/co-conspirators. Then I think it would be great to move the Zelda franchise into a new land with a different set of characters. Everyone asking for Steampunk Zelda need to recognize how trendy that concept is at this point in time. It would be like if they had put out Twilight Princess after the Twilight movies had been a big thing. I hope that concept does not happen. It's already a few years too old to be something new and unseen. BTW, I love the Link Between World art style. It keeps me in that LTTP world... a place I have a great fondness for. Sounds good to me! I'll imagine it will be a setting unimaginable! I think they were onto something good with the Skyward Sword desert time travel. The past and present encapsulated together working hand in hand. You could even be more experimental by creating an alternate universe where Link isn't the only hero saving Hyrule. Or maybe even realize Dark Link as an alternate Link, in this other world Ganondorf is the hero. It's important to make both realms co-exist together. How about getting even crazier and setting some story in modern day times? Too weird? @Peach64 Link's Awakening and Oracle of Seasons/Ages say hi. And I don't know if you played Skyward Sword or not, but that story clearly explains why it's always another Link, another Zelda, and another demon (there actually have been other villains besides Ganon... Vaati, Bellum, Malladus, Onox, Veran, etc.). Also, is that not how every "chosen one" story goes? There was a "chosen one" long ago that miraculously defeated some ancient villain, and now that that villain has returned there is a new "chosen one." In my opinion, it is quite fascinating how we actually get to see the same events repeating throughout history just a little different each time. And ultimately, the Legend of Zelda series (like most Nintendo games) has rarely been story first and each game is different enough that I have never felt it to be a remake (except the actual remakes). Obviously there are similarities between the games (a water based dungeon, a dungeon in the forest, etc. ), but is that not what defines a series? I would rather the story be similar between games than the gameplay be the same between games. @Kirk , lulz, well I fact-checked my initial comment and it turns out I was right. Lucky for you, you can always play Angry Birds on your iPhone where the graphics are to your liking and the plot is just deep enough for you to follow. @Boxmonkey, unfortunately you're probably right about Zelda U being a couple more years away. Which is inexcusable to have a new console with no new Zelda for 3 years from lauch?! N has the resources to dedicate the manpower to getting it done in the next 12 months. I'm not suggesting they "rush" it like they did the U console, just invest in delivering a grade-A new Zelda game for this U console within the first two years of its launch. Do NOT want a modern setting. DO want a limited tool set, such as just sword, shield, boomerang and slingshot. And DO want an emphasis on exploration, non-linearity, with no hand-holding. Land, sea and sky areas meaning travel by horse, boat AND bird would be a MAJOR bonus. I think the world should be in a futuristic setting. Nintendo actually wanted that once. But they ended up making a Fantasy-only setting. 50's style semi-contemporary post-Spirit Tracks version of New Hyrule! Complete with schoolkid version of Toon Link taking a bus, only to find a sword and aghaghaghaghaghagha--you know the rest. You're supposed to check with your eyes open. @Goginho I like your ideas. I agree, I would be excited if the game that comes next makes us feel emotionally attached and completely immersed in this fantastic world. I remember feeling that way at points in past games and completely in some (like Ocarina of Time). I think the only thing I would add to your comments is that there needs to be a feeling of distance and closeness. Times where we actually feel claustrophobic and times where we feel completely alone. Perhaps when a dungeon or overworld feels too linear it takes away from the potential for both of those feelings. When I was younger, I remember the artwork in the A Link to the Past Player's Guide fueling my imagination. It was dynamic with intense amounts of mood lighting and complex creatures and settings. That was an artistic interpretation of the game world. Now it just may be possible to create in game with the technology out there. That would excite me a lot. Nevertheless, I'm sure I will be enamored with the new game. I trust Nintendo. Well didn't Link go straight to Termina in MM after OoT? And didn't Link set off sailing and end up on an "island" in Link's Awakening after he finished with ALttP? Also, the Oracle games are set in different countries. Also Spirit Tracks takes place in New Hyrule, completely separate land from the original Hyrule. I'm pretty much up for anything, though after reading the comments, I would love to see either a steampunk or modern/futuristic Hyrule. I think it would be fantastic too if Link and Zelda were living in a timeline where princesses and heroes were obsolete, and seeing how that affects each of their roles. Looks like Zelda U it really would be something HUGE! and different so I love that. I trust in U Aonuma-san and team. I like that "distance and closeness". Ocarina did a great job in evoking emotion, especially during some cutscenes, which only motivated me even more. I want certain aspects to be open for interpretation, to be thought-provoking, even political. We've been given a taste of that, but I feel that it can get much deeper. And that feeling of being "completely alone" you mentioned, I find great. Link has always had a companion and helping hand along with him (for the most part). This loneliness can not only be emphasized through colossal structures, empty areas, and being cornered by thousands of foes, but also through betrayel. Have me feel bad about myself and even guilty at a certain point. I think Midna did a good job at doing something in that direction, and she is, imo, the most developed and dynamic side-kick. Make me, the protagonist, be the bad guy for a while. Make me question Link's morals. I don't know how but I know Nintendo have the imagination and caliber to come up with unexpected things like that. Here's an idea, instead of having Princess Zelda always recognizing the good in Link, and being mostly dependant of Link, make her actually be against Link for a bit. Make her be foolish and stubborn. Make Link earn her trust through her endangerment. No need to constantly seperate the "good" and "evil" in the most obvious, predictable and old-school fashion. No need to make everything black and white all the time. Have some neutrals, some collaborators, traitors, in-betweens...etc. Majora's Mask did a great job in putting me (literally) in others' shoes to see the situation through their eyes. But the loneliness factor, the distance and closeness what you said I find really great and would definitely make for a memorable, emotional, and engrossing Zelda gaming experience. Some games you play once or twice, and you know them almost inside out. They stick with you, and yet you come back to them by choice, only to realize that there are still little things, details, dialogues, easter eggs you've previously missed. Other games you can play multiple times, and they won't have the same impact, and soon enough, become forgettable. Flying upgradeable horse joust battles. Take whatever artstyle you want, just don't make 90% of the enemies really goofy and unintimidating. I loved Skyward Sword but it did seem like the enemy variation and design was a huge step backwards after Twilight Princess. Ghirahim, Koloktus and Demise are fantastic exceptions. I honestly don't think it'll be that ambitious of a game. Seems like they haven't been working on it for long, yet, for the sake of the Wii U, Nintendo can't afford to take too long to develop it either. If you asked me what I want from a new Zelda game, I wouldn't be able to tell you. I don't have any preconceived notions of what the next Zelda game should be, or what I want it to be. All I know is that I want a new Zelda game. Give me a new Zelda game and I'll be happy. I've never played a Zelda game that I didn't enjoy immensely. Personally, I trust Nintendo to make the Zelda game that they want to make. And THAT is exactly what I want. I'm not sure why he's emphasizing uniqueness and changing conventions now of all times. As if The Wind Waker hadn't already changed things enough. At this point I don't even care what they do with the Zelda franchise, as long as they don't make Hyrule some kind of irksome hub world where you have to travel, using some mode of transportation, to the main areas where the dungeons are kept. I would like to see Hyrule built with the focus on exploration like it used to be, wandering into new places that you can't yet access, finding a seemingly random hole in the ground, or coming across some bizarre character that you find out later serves a purpose. If they could achieve that again, yet evolve the idea, I would be happy. As for art style, I just want it to feel like Zelda. As I'm playing through The Wind Waker again I'm realizing that the cel-shaded art style and chibi character design actually does feel like Zelda, to me. It has that essense, probably because it resembles Zelda 1 in some ways. However, where it doesn't feel like Zelda is the overworld. The seafaring pirate theme does not feel at all like The Legend of Zelda, it's only when you're dungeon plundering that it feels like it. In my opinion, anyway. After the curveball that was Skyward Sword, at this point I'm like "Do whatever you want with it Mr. Aonuma, I guess we'll see how it turns out." The problem is despite flaws games like Skyrim, or the Witcher 2, or even Final Fasntasy have a much grander scale. They leave a lot more up to the players imagination rather than the developers. I don't think Zelda should become an open world do whatever you want with no guidance type game BUT I think they have become too strict and linear path story driven. I prefer games where the game doesn't play EXACTLY the same for every person, and I like taking my time yet actually having things to do with that extra time I take. I also dislike how specialized the dungeon items/weapons have become and control swinging just isn't fast and accurate enough for entertaining enemy battles. I can't wait for the Wii U Zelda! Just CANNOT! Did you play Skyward Sword on a laggy TV? I've played SS on my Samsung and my sister's Panasonic, and there is a world of difference in the gameplay on her TV. Some TV's have sadly so much image processing that there's an unbearable lag when playing. My sis' Panasonic doesn't even have a game mode! I have zero problem on my Samsung. The Motion Plus controls work flawlessly! I'll be sad if SS will be the only Zelda employing that control scheme. Against a new unstoppable enemy. Link is forced to team up with Ganondorf in order ti defeat it. See Terminator 2. I love your vision for the game! It sounds like Aonuma needs to play skyrim or something. I have only seen people play it, but making a zelda game more personal is really what needs to happen. OoT is the best because of the emotional connection with all the characters and environments etc. I have high hopes, if only they hire new people with fresh ideas. I'm a little worried about the setting being too different from Zelda. I don't want anything futuristic, I want the hero with the master sword not some master gun or anything like that. They better not take too many risks, they need something massive to grab attention. If they're going to steal the stage they need something everyone likes and not roll the dice, this is the game that will really get them back on track IF they do it right. They shouldn't be risking right now! @Peach64 They have done that before - Link's Awakening / Oracle of Ages / Oracle of Seasons / Majora's Mask. I think this time, ZELDA will be in a urban city environment taken by GANON. A city where the shadow reigns. But a Green clothed warrior will rise and save the DAY!! @JebbyDeringer That's how Zelda started out! A completely open world do whatever you want with no guidance type game. It was one of the first of that genre! Steampunk Zelda where Link has talking cyborg hand. I have a feeling it will be "modern day". There is a rumour going around about that too. Some people leaked the beans when they saw a behind closed-doors press conference or something like that. Imagine Earthbound+Zelda and you'll get the idea. i think a cool premise could be if the game starts with link as lowly trainee in the hyrulian army when war breaks out with one or a few neighboring kingdoms via invasion. the art style would be most similar to twilight princess because the theme would be pretty dark. as princess, zelda is the commander in chief of hyrules forces. hyrule could be the kingdom that's in the center and other kingdoms want a piece in pursuit of the triforce and encroach into hyrule from many or all sides and have to be beaten back. this could be done by travel to friendly alliance kingdoms that have been invaded to liberate them, battling them in hyrule, or infiltrating the enemy kingdoms. link could be a lone-wolf agent of hyrule and get promoted through the ranks by Zelda as the game progresses. higher ranks come with more abilities such as skill techniques, access to a horse, commanding platoons of hyrulian soldiers into battle or to construct bridges to reach new areas or access to special shops and items. neighboring kingdoms could have their own races, monsters, technology, culture, etc and link could benefit from his travels to diverse lands by collecting diverse items and skills. i picture each kingdom could range from the size of Termina from MM to hyrule in OoT, depending on how many there are. maybe war with the other kingdoms could be resolved by defeating a major dungeon or castle to oust their evil or possessed leader in favor of a nice one who wants peace and trade with hyrule. there could be a prevailing sense of hyrulian pride an unity as well as a dark and tremendous fear of being overtaken and enslaved at any moment. this is a stretch, but maybe there's a time limitation like the moon falling in MM only it's an invading unit that reaches hyrule castle and you have return every several hours of gameplay to hyrule castle to defeat them and buy more time. i LOVE the random weather changes idea and how the weather could affect battle and the environment. the steampunk motif could work well with this concept too. link could make use of steampunk war machines such as a small personal tank or plane. also i'm all for tons of overworld secrets and sidequests, but what zelda fan isn't? sorry to drag on, but i really think it would be a sweet concept that would be fresh while keepimaintaining the elements of the series that we all keep coming back for. It doesn't even have to be in any kind of Hyrule, and the villain doesn't have to be depicted as a boar... Infact I'd recommend a major change in alot of thing as longs as they don't make modern Zelda I'm okay. @ajbennett60 this could could be a good idea, and if it's a war they need to make CPUs able to. Fight for themselves for once. I wonder what the setting will be! Maybe Zelda underwater?! Good luck coming up with a Zelda setting I haven't imagined yet... That fits in a Nintendo environment. I know how the internet 'thinks'. Hylians-Believed to be extinct along with the Zora and Rito people, the country held by humans is the namesake of the hylian people who came before humans. Humans-The last of the Goddess's Chosen people... Though they do not bear the looks or the Magic of the Hylian people who came before them they still call their country Hyrule. They are the Ruling Race of Hyrule and Govern most of the Country with the Help of the Gorons. Goron-They have Risen to the top of society alongside Humans with their use of explosive weaponry and Rocket Technology. Evolution and Nuclear radiation have changed their bodies to resemble humans only with rockhard greyish/brown skin, and stone-like extrusions from skull instead of hair. Mogma-Once a proud race of miners the Mogma's social, economic, and religious structure change with the coming of technology. They wished to stay true to old the old world by keeping Magic and Spiritual power alive and Now live as a race of Nomadic Shamans and Priests. One Notable Difference between the old Mogma and the New is that they no longer slouch down but stand erect. They have also lost their strange goofiness and now have a more serious attitude. Deku Scrubs-Likely the most changed of all the races throughout the history of Hyrule. Once small in stature the Deku Scrubs Now stand over 8 feet tall. No one is quite sure what caused the growth of the Deku people but size was not the only change. Their mouths No longer protrude from the head but now form a wide wicked smile that is constant and unchanging. Their bodies once bushy and plump are now slinder and lose all trace of greenery after reaching the age of 15. They are rarely seen within the walls of Castle City but do show up from time to time to trade. They are seperated into to types based upon how they react to other races... Savage Scrubs and Civil Scrubs... Where they live is a mystery. They are masters of poisons and potions. @Ricube How about No ? I know that nintendo wants its key demographic to be children, but, come on! Zelda is one of nintendos oldest intellectual properties why do all the new games have to look like they're for 3 year olds? I want to see a massive change to the whole zelda universe to make it darker, more serious, and more expansive. It doesn't exactly have to be an Elder Scrolls rip off. It can still feel like a Zelda game if they do it right. The graphics need a complete change. They should become more detailed and realistic. The game should have the feeling of impending doom, like OOT later in the game. Nintendo needs to get off this whole "Zelda theme" thing they've been doing lately. Flying Link, Sailing Link... Train driving link?? WTF!!!. Nintendo needs to stop playing to preschoolers and get back to its original fans! Next thing you know theres going to be a "dinosaur riding Link from the stone age"!!! I'm sure nintendo knows how much dem kids love dinosaurs! Set it in a High school. Free non-linear exploring of a large, rich and immersive overworld, and maybe occasionally a few dynamic events. A possible multiplayer option: one person on the gamepad and one person on the TV. No more weeds/pots with hearts/rupees etc, it just makes things too easy. Just allow us to buy and carry around 4 healing/mana/fairy vials max, and be able to swig them down quickly in battle when needed. No more boring fetch quests, or repetitive mind numbing tasks (like feeding bait to the same fish repeating the same dialogue over and over). No more ubiquitous pushover trash mobs like slimes and scrubs. Every foe should be dangerous and menacing. You have to watch their movements closely and find openings to attack or counter. I am not against the use of wii motion as long as it’s done reasonably well. Only do the epic chest opening sequence for the really epic items. Make bombs the size of grenades and no longer growing out of the ground. Basic choices for responding to NPCs, like chivalrous/roguish/silence, or positive/negative/joke/silence. Your responses/behavior can dynamically change the disposition of npc’s towards you. A large number of fun side activities. I’d like to see these: boomerang dodgeball (like tron disc wars), castle tournaments with jousting/archery/etc., horse racing/breeding, collecting masks, pictobox photography side quests, playing an instrument, monster hunting, tavern card games (blackjack and poker was fun in RDR, so was that collectible card game from FF8). Decorate your house as a showcase of your accomplishments: a pictobox photo gallery, mask collection display, medals and trophies from archery/racing/jousting. Customizable shield heraldry, optional clothing changes. Some choices you make during your adventure can effect the overworld and NPCs at endgame in subtle but noticeable ways. I’ve never cared about voice acting, so no need to include that for me. I want something set after skyward sword. The Hyrule in that looked really interesting and I'd like to see it in it's entirety, all connected with a proper overworld. It should also be a lot more populated, it was really lonely. I want to visit the recovered Sandsea as a normal sea. it would be a great place for exploration and it's much bigger than Lake Hylia. The only problem is that for it to feel like the same Hyrule, it needs similar art and that would be boring. I liked Twilight Princess' though, I want another realistic style. Also, I was super excited when I learned that Skyward Sword would have a sky setting, but it was sort of wasted. So when they bring the sky back one day, I'd prefer it as a darker place mainly for the last or second-last dungeon rather than as an overworld. There's also still the option of mixing it up, like, they could make an ocean but with the three huge continents around the map with lots of smaller islands around for exploration and side quests.